With the ramping up of smelter capacities, alumina or aluminium oxide, the major raw material for aluminium smelting, sees quick demand in the market becoming an irrevocable factor to drive the entire value chain of the aluminium industry. So to say, its availability and market price across the globe perform as some of the key factors that navigate the aluminium businesses and help aluminium players take analytical decisions. Let’s take a look at alumina’s price trend in China’s spot market and the rest of the world through the first two quarters of calendar year 2018 and explore its effects on the aluminium industry. China’s alumina spot price started surging from the late third quarter of calendar year 2017 reaching the highest point in November at US$ 564 per tonne. 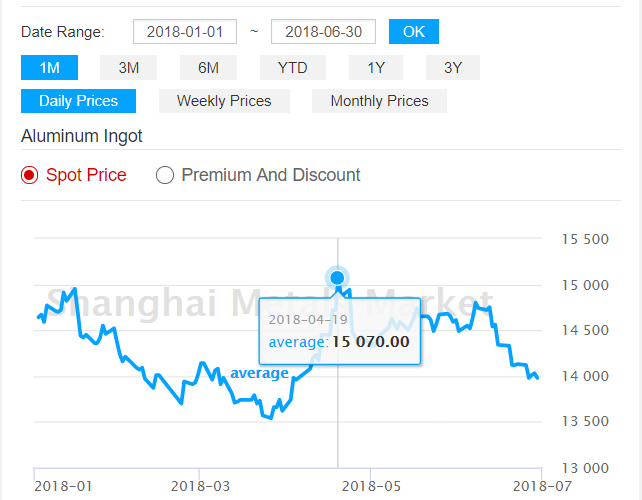 Shanghai Metals Market data shows that the bearish trend in alumina spot price commenced towards the end of 2017, and since then had been struggling to stay afloat on the face of slow demand. Compared to December 2017, when the alumina price rallied between US$ 504 (RMB 3416) per tonne and US$ 422 (RMB 2855) per tonne, the price in January hovered between US$ 422 (RMB 2855) per tonne and US$ 428 (RMB 2897) per tonne. This indicates that the price in January was on upward trend though range-bound in contrast to its previous month. In February and March, the alumina price dwindled further but within a tight range. While in February, the price ranged between US$ 428 (RMB 2897) per tonne and US$ 416 (RMB 2819) per tonne, the price in March stood at US$ 416 (RMB 2819) per tonne to US$ 401 (RMB 2718) per tonne. The drop in alumina price in the first quarter was mainly due to a slump in aluminium ingot price on the rise of domestic primary aluminium inventory despite the environmental reforms and sellers’ willingness to shell out stock at a lower price as they were drawing good profits because of the fall of bauxite and caustic soda prices. However, the alumina price was anticipated to grow post Chinese New Year holiday from February 16 to February 21, but unfortunately, the cost remained flat and dropped further. In April, the second quarter of CY 2018, the alumina spot price started gaining back in China. 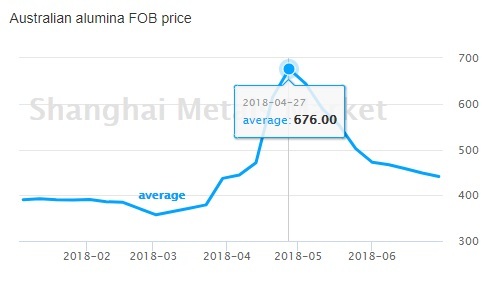 After hovering at US$ 401 (RMB 2718) per tonne in the beginning of April, the price climbed to reach as high as US$ 463 (RMB 3135) per tonne, as of April 27. This growth could be attributed to the tight supply in the international market due to Hydro’s 50 per cent production cut at Alunorte alumina refinery because of non-compliance relating to bauxite residue deposit at the end of February, followed by US sanctions against Russian aluminium giants including UC Rusal in April. The above graph shows China’s alumina six months price. In the first quarter of 2018, Australian alumina FOB price, had registered a steady trend except for a plunge on January 23, from US$384 per tonne to US$ 357 per tonne. Post that, the price remained stable and showed a significant hike on March 26, right from US$ 381 per tonne to US$ 425 per tonne, according to SMM assessment. Australian alumina fob price neither shied away from registering the highest record during the second quarter. Buoyed by force majeure at Hydro’s Alunorte alumina refinery, the price gained to reach as high as US$ 710 per tonne dated on April 19, 2018, and remained the same until it shrank to US$ 625 per tonne on April 26. This had been the highest number recorded since the index was launched in August 2010. 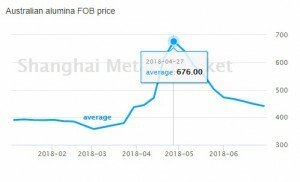 Thus, the price difference between Chinese alumina spot price and Australian alumina fob price around 19th to 26th of April ranged between US$ 279-247 per tonne. Australian alumina fob price recorded subsequent drops in May and June. After registering a slight hike to US$643 per tonne on May 2, 2018, it dipped through the rest of the month and stood at US$ 472 per tonne in the end, metal bulletin data found. In June, the price further registered a month-on-month decline, however, within a limited downward room. The above graph shows six months Australian alumina fob price. Coming back to alumina spot price, it also started displaying a bearish sentiment in May, starting the month from US$ 463 (RMB 3135) per tonne. The price then continued to show restraint until it plunged further to S$ 446 (RMB 3021) per tonne on May 31. Since the beginning of May, China’s domestic alumina prices dropped RMB 70 per tonne. 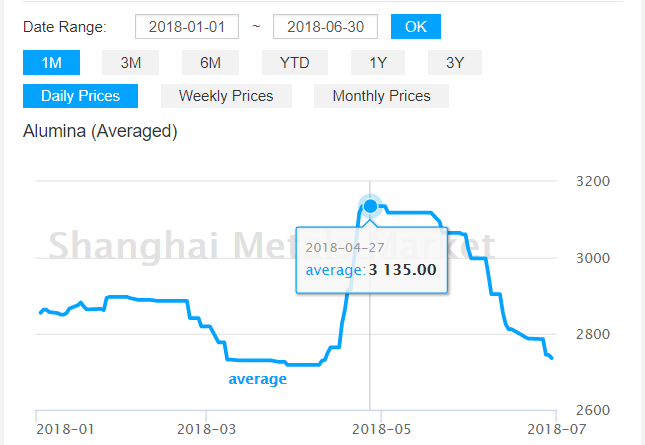 Shanghai Metals Market had anticipated that the alumina spot price decline towards the end of May would be limited because of continual low stockpiling, allowing sellers to hold their offers firm. In June, the alumina spot price extended its decline facing pressure from higher operating capacity, potential surge in domestic supply, and falling prices of aluminium ingots, according to SMM. Major traders in Shanxi and Henan began to sell spot cargoes and Guangxi slowed down its pace to export shipments that increased the possibility of alumina being sold in the domestic market and in turn, supressed the domestic alumina price further. The first fifteen days of the month witnessed a maximum fall in price, from US$ 443 (RMB 2998) per tonne, as of June 1, to US$ 415 (RMB 2812) per tonne on June 15, while the rest of the month remained relatively range-bound between US$ 413 (RMB 2795) per tonne and US$ 404 (RMB 2736) per tonne. As said earlier that sluggish alumina spot price could be attributed to the dip in primary aluminium price, let’s now take a look at the aluminium price trend through quarter 1 and quarter 2 of the calendar year 2018. In the first quarter, the primary aluminium spot price displayed a downtrend under climbing inventory and low demand across the Chinese market. China’s winter heating season ended on February 15, 2018, which caused production cut also played a key role in declining primary aluminium price. In January to February, China’s aluminium production fell 1.8 per cent from a year earlier, as the country’s pollution crackdown and supply-side reform kicked in. In this background, stocks grew noticeably creating fears of subdued demand and a supply glut. On the face of all these, primary aluminium spot price recorded a dip from US$ 2164 (RMB 14,640) per tonne, as on January 2, 2018, to US$ 2105 (RMB 14240) per tonne on January 31, 2018. Extending decline in February, the aluminium price ranged between US$ 2093 (RMB 14160) per tonne and US$ 2072 (RMB 14020) per tonne, which indicates that the price though dropped remained range-bound, along with occasional signs of upward movements. The price performed no better in March either, continuing downward trends with temporary restraint. From 1st of March to 30th, the price ranged between US$ 2090 (RMB 14140) per tonne and US$ 2013 (RMB 13620) per tonne. Around 14 of March, it, however, registered slight gains ranging from RMB 5 to RMB 45 per tonne across all domestic markets. In the second quarter, the primary aluminium price began showing a positive sentiment, attributed to China’s refined aluminium inventory drop owing to the increasing consumption of downstream products across the market. In first ten days of April, the price jumped from US$ 2031 (RMB 13,740) per tonne to US$2099 (RMB 14,200) per tonne, with successive surges to as high as US$ 2227 (RMB 15070) per tonne, as a result of worldwide alumina price surge backed on production cut at Hydro’s Alunorte alumina refinery and US sanctions on Rusal. Glencore and Rio’s force majeure on Russia-linked contracts also triggered the price of aluminium across China as well as the globe. However, within a couple of days, the price again plunged to 14430 per tonne as on April 27. Driven by increasing production output on a daily basis in April on primary aluminium price hike, the month of May recorded an optimistic sentiment as well, in terms of primary aluminium price. The month started at US$ 2118 (RMB 14330) per tonne and rallied to US$ 2159 (RMB 14610) per, registering slight declines at occasional intervals. This hike continued until the price started recording successive plunges after June 12. For rest of the month, the price dwindled to US$ 2066 (RMB 13980) per tonne, as on June 29, 2018. Hydro’s Alunorte alumina refinery production cut and the US sanctions on Rusal also left a significant mark on LME and SME aluminium contract. After registering month-on-month drop since January, aluminium price on both LME and SME climbed to US$ 2602 per tonne and US$ 2409 per tonne, respectively. From the end of April, the aluminium price on LME and SME began to decline all over again and reached to US$ 2278 per tonne and US$ 2224 per tonne respectively. 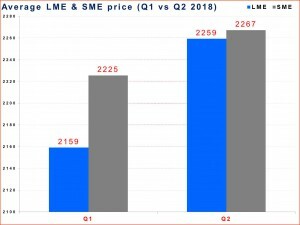 In May, the SME contract registered a steady price range with no significant ups and downs, while the LME contract displayed two major changes in price. On May 5, the price rose from US$ 2316 per tonne to US$ 2384 per tonne, followed by successive ups and downs. On May 23, the price significantly plunged from US$ 2265 per tonne to US$ 2227 per tonne. In the first quarter, both the LME and SME aluminium average prices stood at US$ 2159 per tonne and US$ 2225 per tonne, respectively. In the entire Q2, the average LME aluminium price was at US$ 2259 per tonne against the average SME aluminium price of US$ 2267 per tonne. When do you invest in alumina refinery cost reduction?